Amazon has acquired Whole Foods in June 2017 for $13.7 Bn. It was refreshing news to everybody in the industry since Amazon was an e-commerce and technology company and was stealing market share on grocery shopping via its online services. However, Amazon took a strategic decision, which led to the acquisition of Whole Foods. Amazon did not stop right there. They have made a more exciting decision in January 2018. Amazon has launched a new kind of retail experience in January 2018 in Seattle. This store was called Amazon Go, which has no store staff to help you on your shopping, and you do not need to pass your credit card or your billing information to any machine other than your smartphone, via Amazon Go app. It is quite impressive, and it has created a significant buzz in the industry. Now, let's take a step back, and see what might have happened there for Amazon to make these decisions starting from understanding global consumer behavior, Amazon's penetration in the United States market, and Amazon's move on acquiring Whole Foods. The consumer shift to online grocery shopping is increasing, and Amazon is already there. However, the shift is slow. 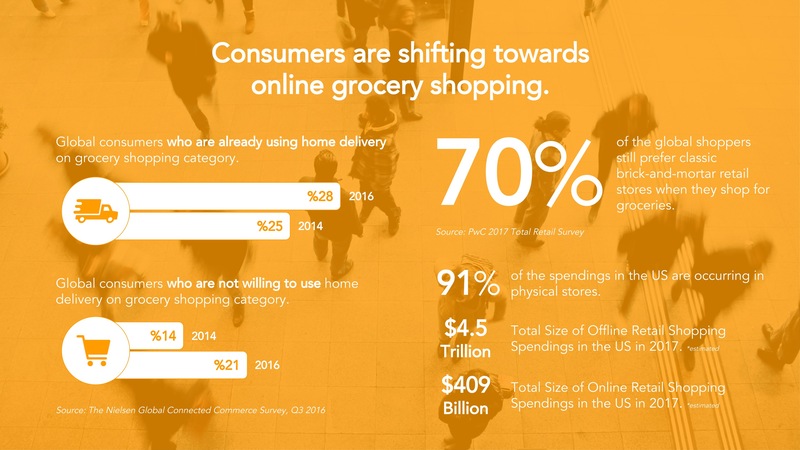 According to Nielsen's "What's In-store for Online Grocery Shopping" research (January 2017), findings show us the rate of growth in online grocery shopping. According to the results, the percentage of consumers who prefer home delivery was 25% in 2014, and it is 29% in 2016. The same research also shows that consumers who are not willing to use home delivery have decreased from 21% to 14% comparing 2014 with 2016. According to PwC's "Total Retail Survey" research, 70% of the global shoppers still prefer classic brick-and-mortar retail stores when they shop for groceries. Even though consumer preferences for online shopping is increasing, the growth rate is not dramatic. People still want to go to retail stores for their grocery shopping and make in-store purchases. Continued with that, 91% of the spendings in the US are in physical stores. Size of offline retail is ~$4.5 trillion, where online retail is ~$409.2 billion. Let's have a look at Amazon Tech. Amazon has an e-commerce area on grocery shopping called AmazonFresh. In addition to AmazonFresh, Amazon has Amazon Prime, where Amazon customers can get their orders in a lightning-fast way. Prime Now membership offers its customers to choose 2-hour delivery or 1-hour delivery in selected cities. A faster shopping experience for shoppers compared with retail shopping, right? In addition to those virtual services, Amazon has produced Alexa-powered assistant devices and Dash, which are hardware products for consumers to make their lives easier. Dash, allows its users to scan barcodes of their products and order them from Amazon right away; it also comes with a microphone, so users can also order groceries by just telling their names. Alexa is a voice assistant that powers Amazon's Echo products, allows its users to complete hundreds of customizable actions. Using Alexa, customers can order groceries from AmazonFresh, or shop from connected services. What is Amazon doing with brick-and-mortar investments? According to Statista, Amazon Prime has 90 million members in the United States by September 2017. The number of members was 65 million in September 2016 - so members have grown by 25 million in just one year. 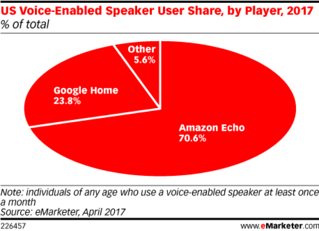 According to the prediction of eMarketer, 35.6 million people in the United States have and using Amazon Alexa. Considering 29.9% of millennials have voice-enabled digital assistants and Amazon Alexa-powered Echo products have 70.6% of that market, Amazon has and is investing in the right place for the future of shopping. Wait. Amazon already has a significant growth on online grocery shopping. Why did they acquire Whole Foods, and why everything is connected? For sure there is no clear answer to why Amazon acquired Whole Foods or opened Amazon Go store. However, considering the consumer behavior we went through, we can tell some answers. Data is one of these reasons. Whole Foods has a significant background data which includes shoppers' purchase and consumption behavior (frequency, correlations between decisions) in the in-store shopping which allows Amazon to play with it on Amazon Prime and other services, and also in the retail area for better intelligence. Whole Foods is a strong brand, and it has an extensive list of private-label products. We know that Amazon has ~40 private-label brands. If Amazon has the best shopping experience, the fastest delivery, the best prices, and now the best products, why would you shop anywhere else? So Amazon did not just buy Whole Foods, it also acquired hundreds of private-label brands of Whole Foods. The pace of the transition to online shopping will increase. Amazon started selling Amazon Tech in Whole Foods stores. Furthermore, Amazon has connected Amazon Prime program with Whole Foods to offer new purchases to consumers. Amazon did put Amazon Lockers into Whole Foods stores. Hence, we can see that Amazon is connecting the physical and digital world, and starts evolving Whole Foods shoppers to become digital shoppers with integrations. 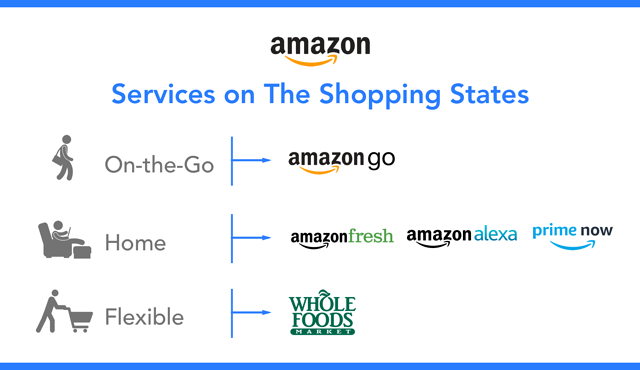 Considering Amazon is connecting its every service with each other, grocery shopping will change by these actions. People who use Amazon for online shopping will increase due to the connection between Whole Foods, better service thanks to the purchase data, and people will start preferring Whole Foods for their retail shopping because Amazon owns it and provides a known/guaranteed customer service along with other perks. This is where everything connects with each other. Starting from the day 1, Amazon has learned a lot. It has a nearly-perfect suggestion system, covers every need of a consumer, provides high-quality customer service, has the best shipping in the universe. Behavioral Economist Dan Ariely says the more someone reflects on spending money, the less stoked they are going to be to spend that money. This statement expresses that the more abstract the payment is, the more a consumer spends. Amazon is playing in that area. 1-Click Ordering, Dash buttons, Amazon Alexa, and the latest, Amazon Go. Fewer steps on the path-to-purchase reflect shoppers with more purchases. Amazon Go is the Amazon online shopping reflection on the in-store shopping experience. Conquering the online shopping, Amazon is changing the world of retail now. As mentioned on our previous article about Amazon Go, it helps Amazon to extend its market with offline retail, collect and leverage shopper data in a better way, and it makes Amazon a leader in the retail area with the technologic innovation they brought. Amazon's master plan here is covering grocery shopping 360-degrees and increasing the pace of consumer shift. Amazon Go, Whole Foods, AmazonFresh, Amazon Prime, Alexa, they are all connected with each other and helps consumers fulfill their needs with a great experience. Integrations make consumers' lives more comfortable, and it will break the walls of grocery shopping - and start a war between the brands on breaking down the commodity. 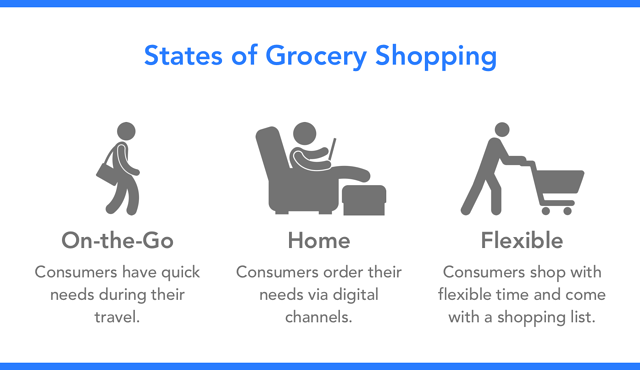 When we observe the consumer states when they shop for groceries, we see three states. First one is our on-the-go needs. When we are moving from point A to point B, we are having quick needs like a bottle of water, a can of coke, gums, or snacks. To fulfill these needs, we are going small convenience stores like 7-Eleven. The second one is our regular grocery needs at home. If we do not want to go out to shop, we are ordering groceries using our laptops/smartphones; we are going to Amazon and select products according to our needs. The third one is regular shopping when we have flexible time. Considering we have a structured shopping list and time, we are visiting grocery stores like Walmart or Costco, and making our purchases from there. 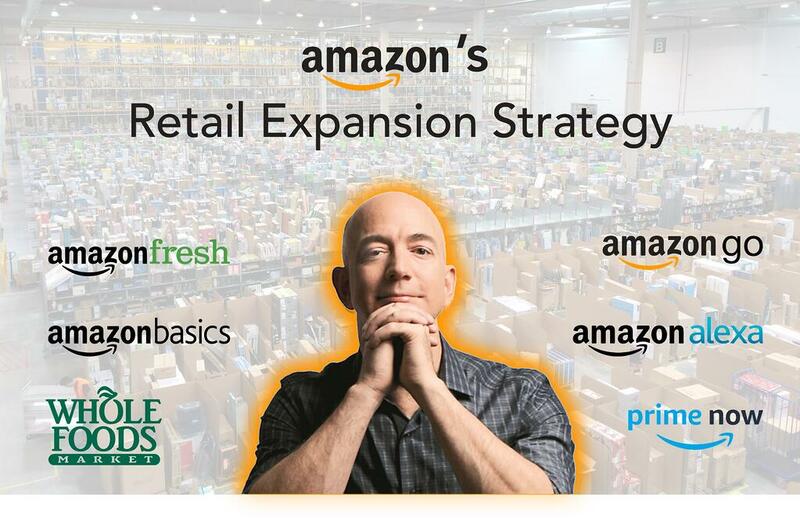 Amazon acts visionary on this area, and according to the shopper behavior, they are on the right path. Covering shopping 360-degrees, allowing consumers to make their purchases without a time, location and product list constraints are what makes consumers happy - and providing a good experience in all these areas is making Amazon irresistible. Amazon's retail strategy will push traditional brick-and-mortar retailers to innovate and compete with each other via innovations other than basic discount techniques. In the past, coverage and prices were the main differentiators, but with the newest disruptor in the market, the commodity is a reality more than ever; and these values are no longer as vital as they were in the past. Amazon is tapping into the traditional industry; which will make Amazon steal a significant market share from its traditional competitors, and will increase the consumer shift to online grocery shopping with right moves. We are not quite sure about Amazon's next moves other than optimizing its services and increasing the coverage; but Amazon has opened a new era in the retail world, and even though consumers are ready for it, the retail market is not. If you want to learn more about Amazon Go and what can retailers do about it, read our blog post Amazon Go is the Pioneer of the New Retail Era.